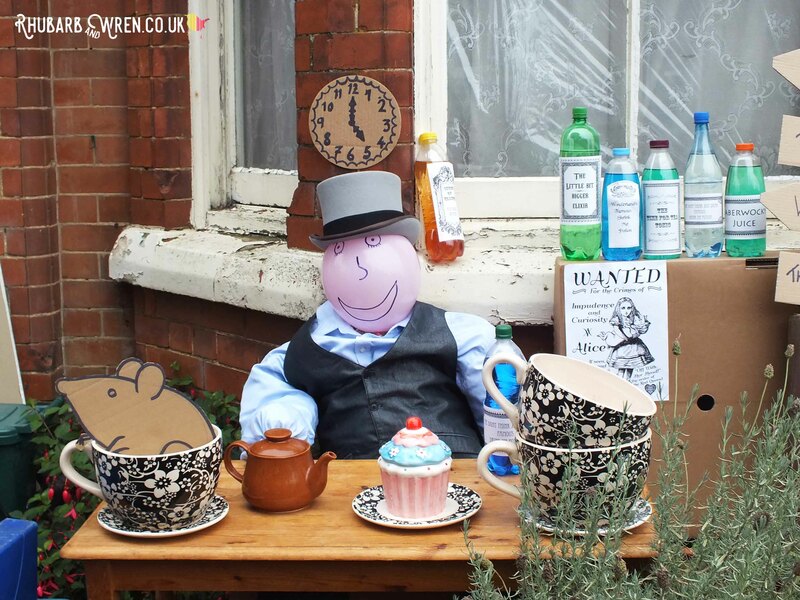 ​My contribution was the playing-card gardener. 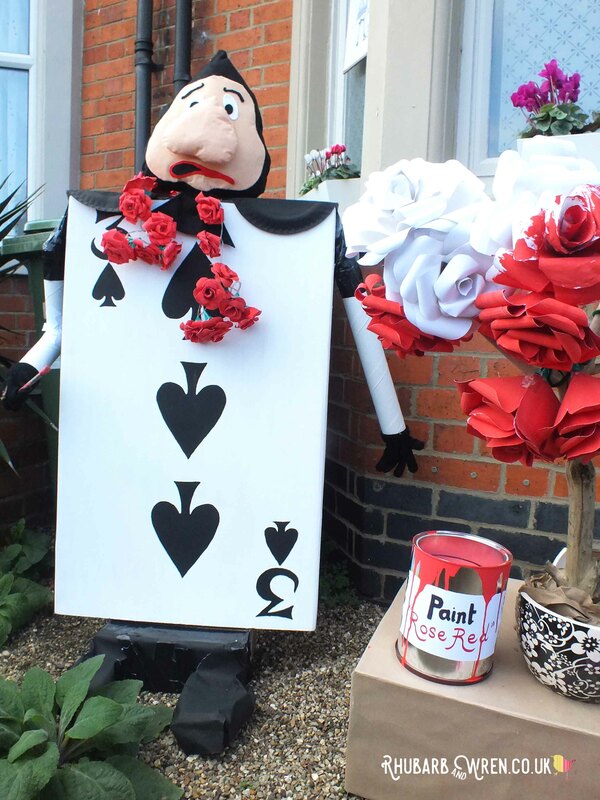 In the Alice in Wonderland story, the gardeners have planted white roses by mistake (the Queen of Hearts had ordered red roses) and so when Alice meets them, they are frantically painting the white roses red. 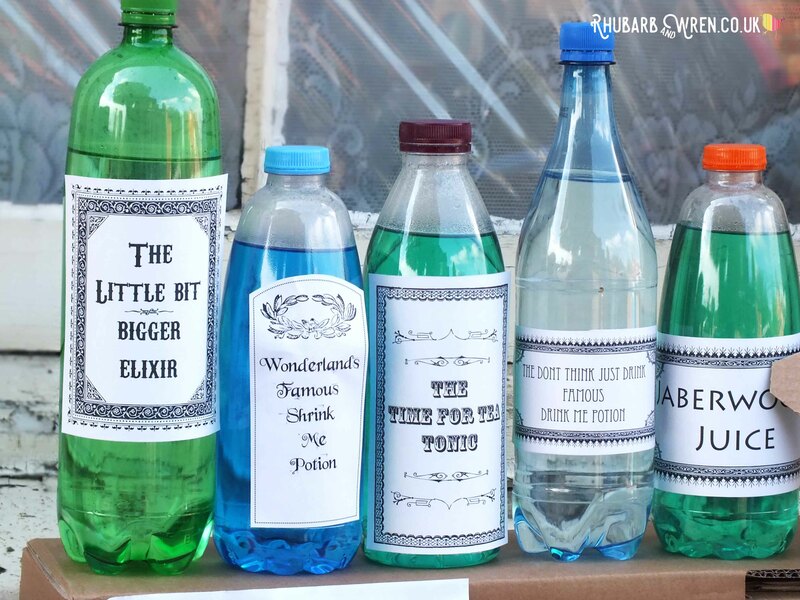 If you like the look of these Alice in Wonderland wanted posters, you can download them for free! 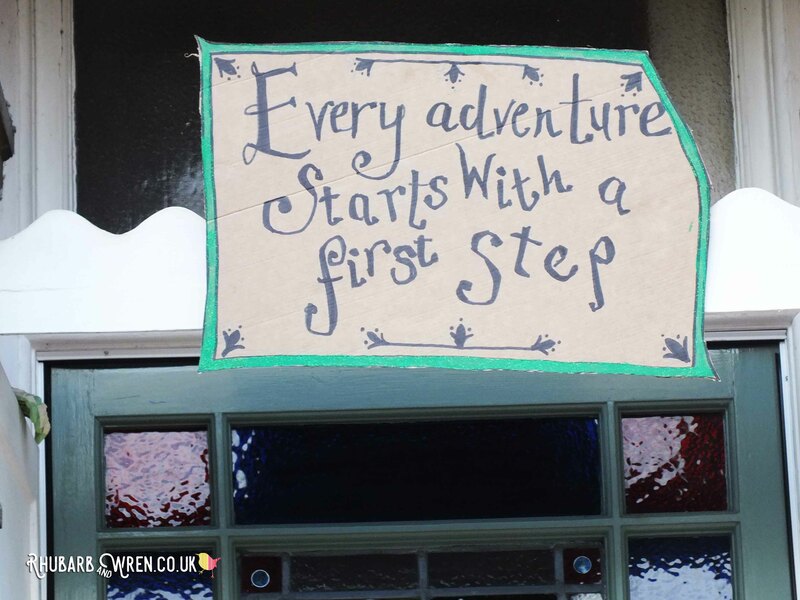 Check out my printables page for the link (these are provided for personal use only). 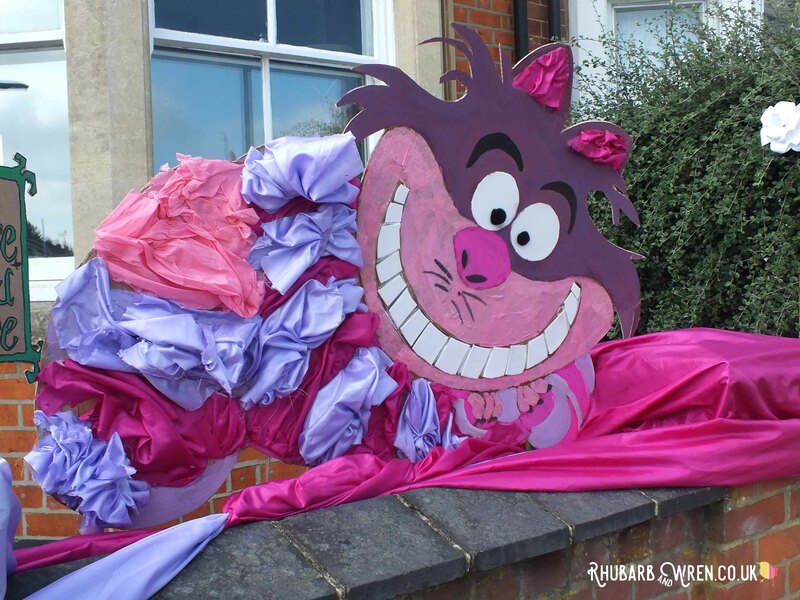 Being tardy is a serious crime in Wonderland! 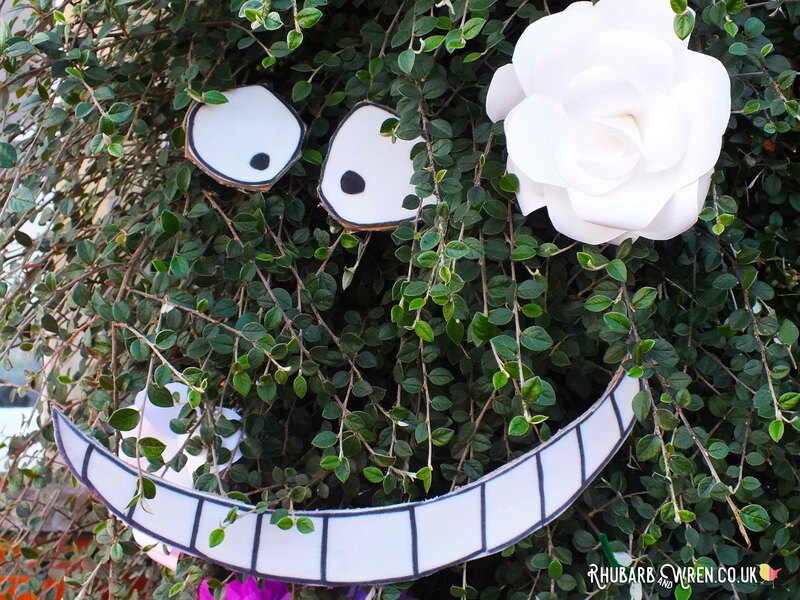 To make the rose tree, I used an old branch from the garden for the base and ‘planted’ it in half of a broken giant teacup plant pot (dropped while lending to a friend down the street for her Mad Hatter tea party scarecrow – luckily I had several of them!). 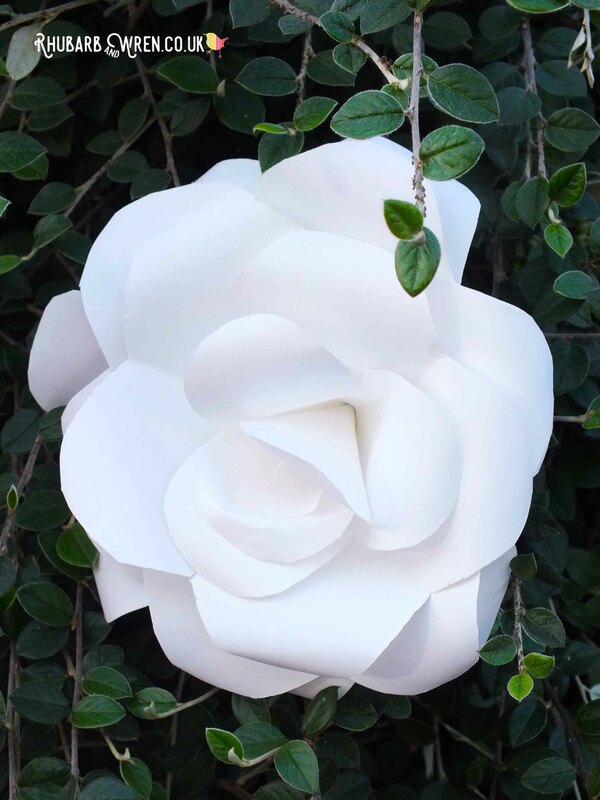 Note the cunning use of Amazon packing brown paper to simulate earth!The roses themselves were done over several nights using a combination of methods described here and here. 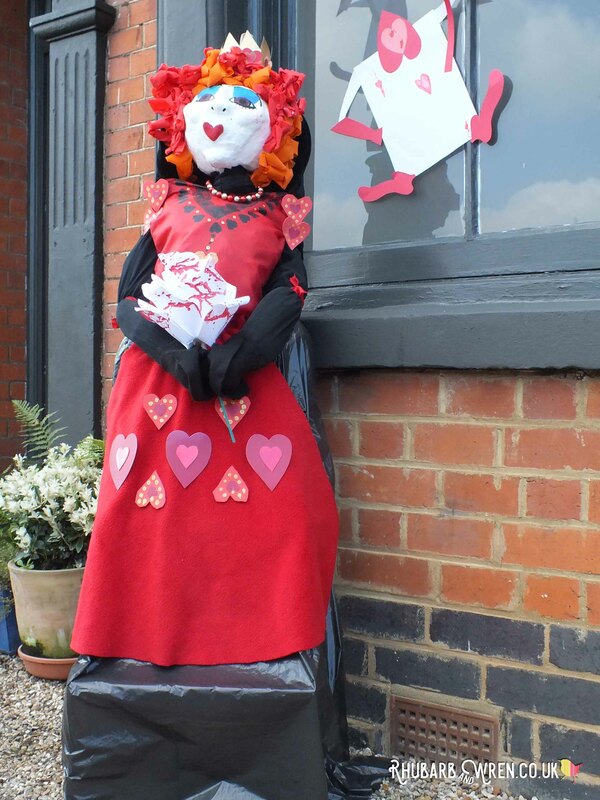 Paper roses being painted red by our playing card gardener. 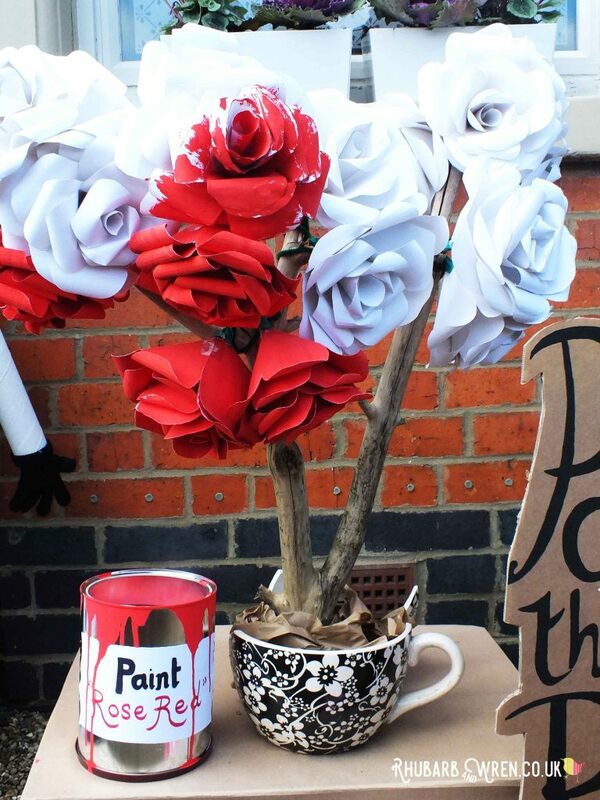 I tweaked these methods ever so slightly and painted some of the sheets of white paper with red paint (bog-standard poster paint from the kids’ paint box) before I made them, rather than using red paper, as the red roses needed to look painted. 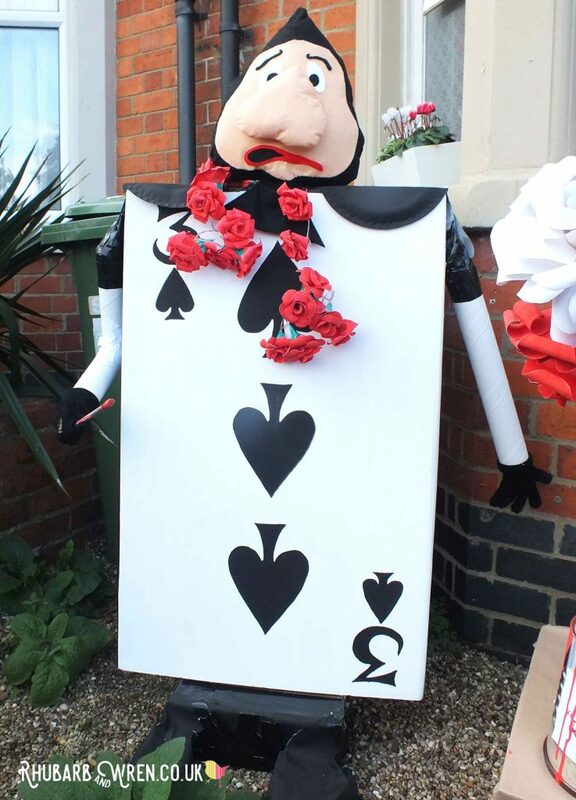 I half painted one of the white roses after assembly to make it look as though my Alice in Wonderland scarecrow was in the middle of the job. 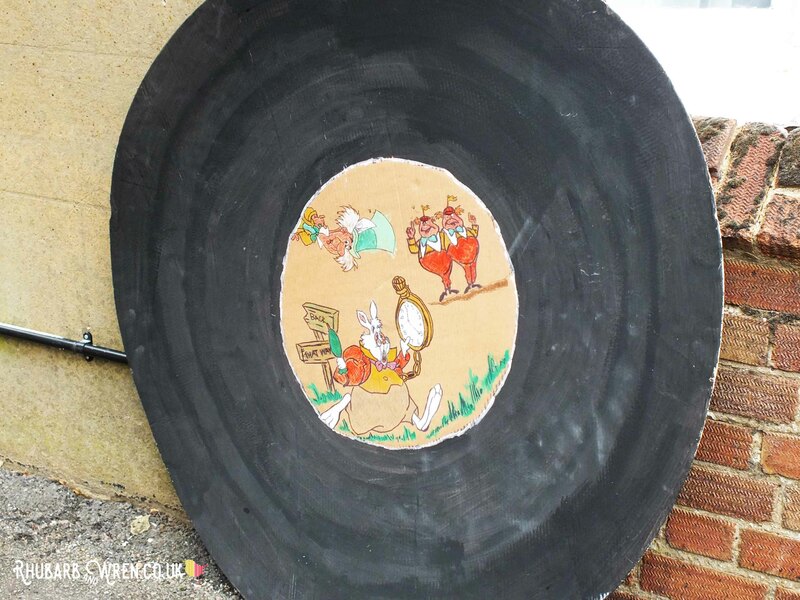 ​As a finishing touch, I dribbled some of the paint around an empty coffee tin and popped a circle of painted card inside to mimic a tin of paint (colour – rose red of course!). 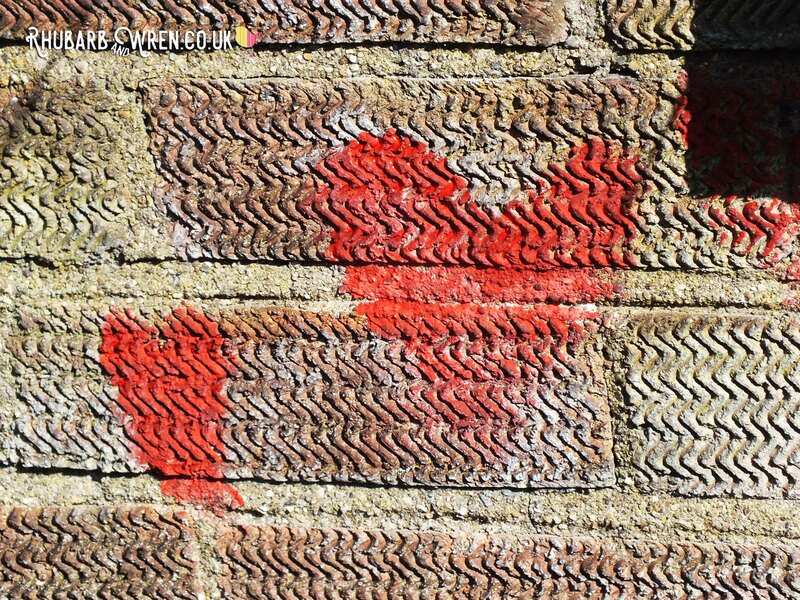 Rose Red paint tin, made out of an old coffee tin. 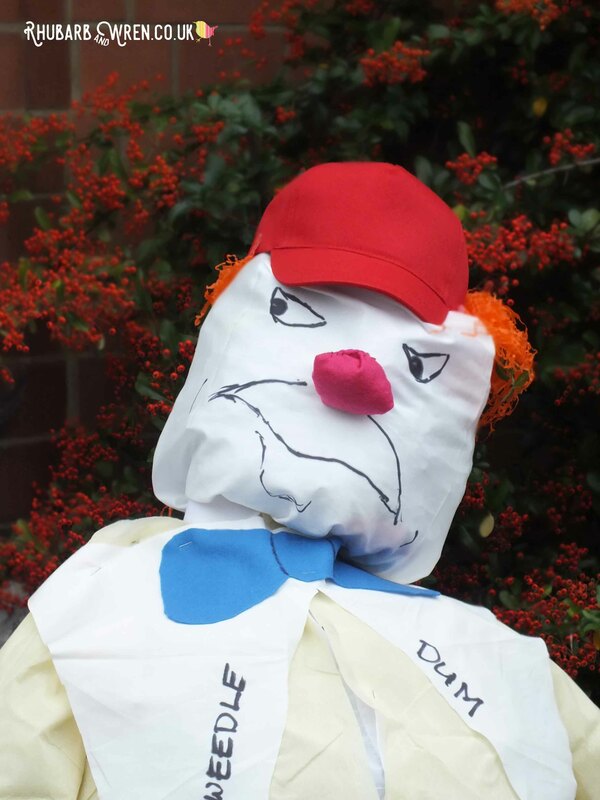 Mr Three of Spade’s head was made with felt, kind of like a cushion case, but with the neck left open so I could push a long cardboard tube right up the middle to hold it in place. 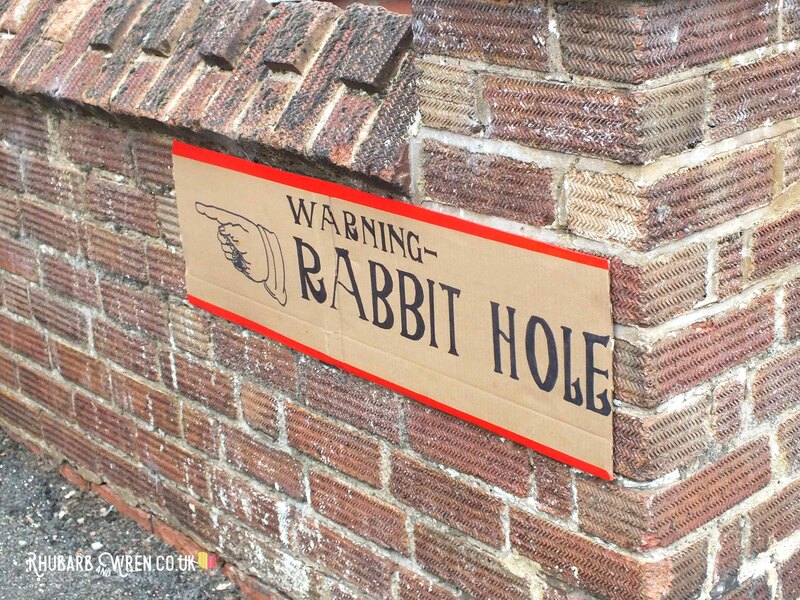 The body is just corrugated cardboard painted white and black; the epaulets were paper plates painted black; and the arms are white cardboard tubes held on with duct tape and hope. They were the most fiddly part! His hands are a pair of G-Man’s old gloves (with pipe cleaners inside to make them posable). 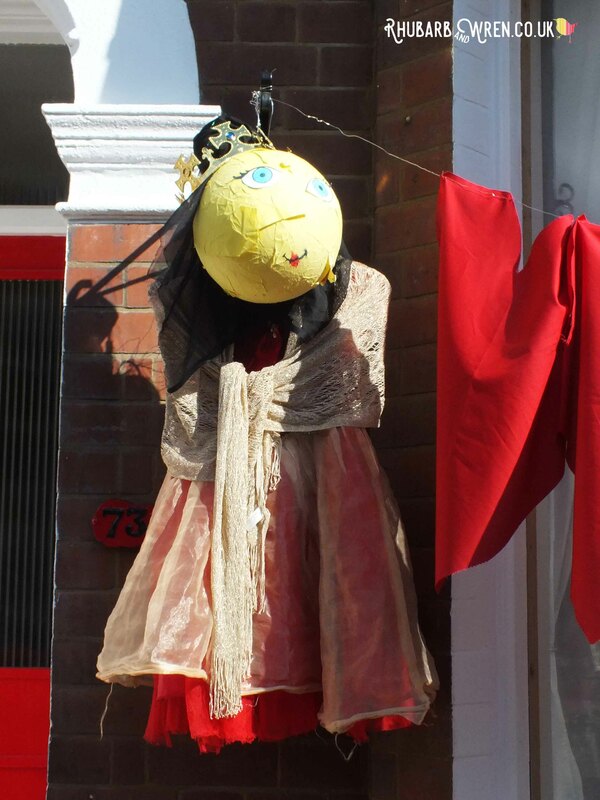 Don’t look at the feet – they were VERY last minute and horribly awful. Playing card gardener’s head made out of felt. 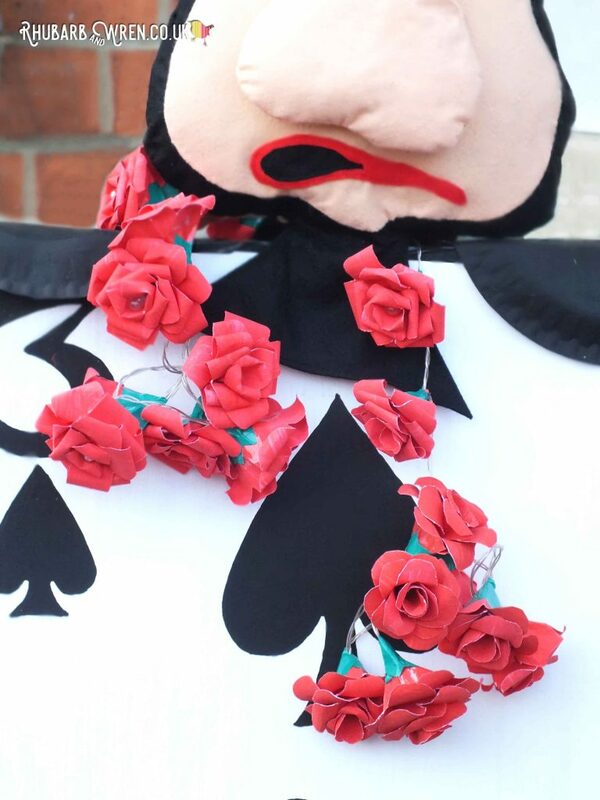 The roses around his neck were made with the offcuts from the paper used for the large white roses. I painted these red on both sides and then made these much smaller roses up around the bulbs on a string of red LED lights (you can’t tell in these pictures, but they look AMAZING at night). Very easy to do but it looks so good, I might have to make a few more! 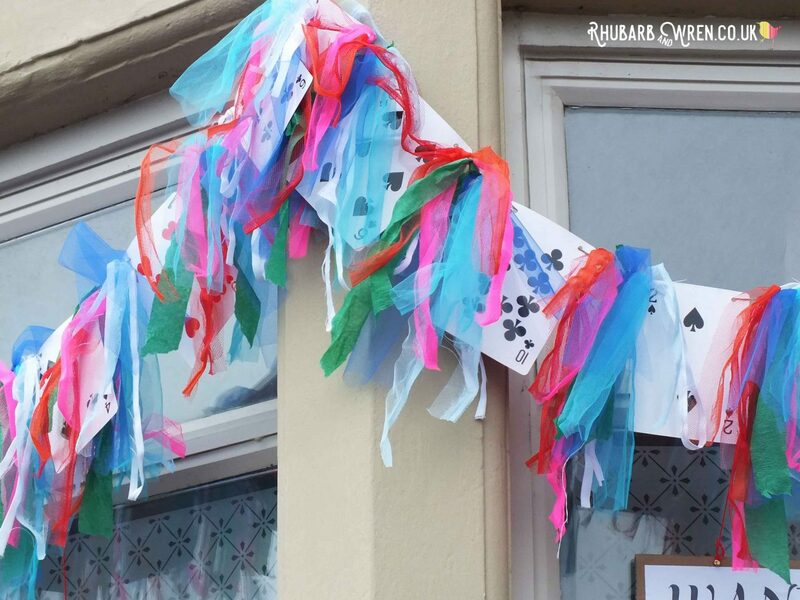 The Alice in Wonderland bunting is oversized cards (thank you, ebay cheapness) hole punched and strung on a length of twine. I tied offcuts of tulle and white cotton (from the Scrap Store) in between. 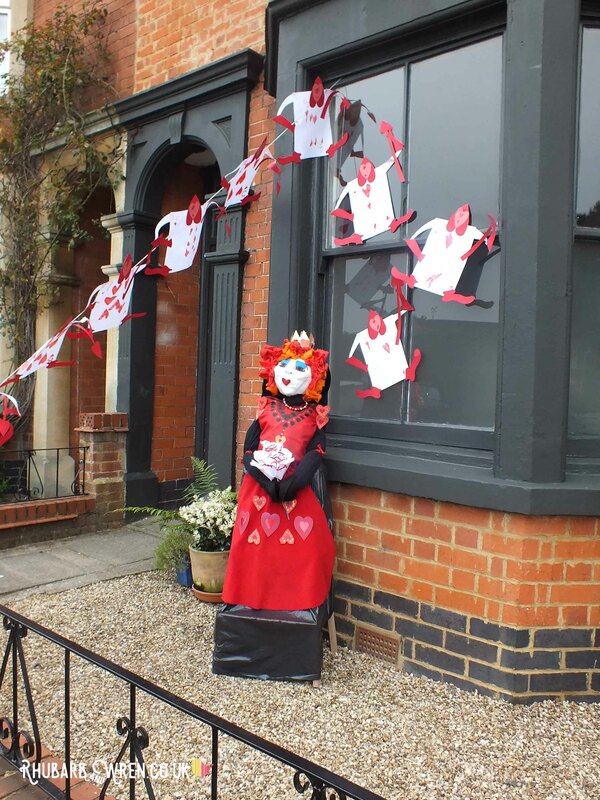 The colours were meant to represent different characters from the story (red for the Queen of Hearts, blue and white for Alice, pink for the croquet flamingos…). More playing cards for the bunting! 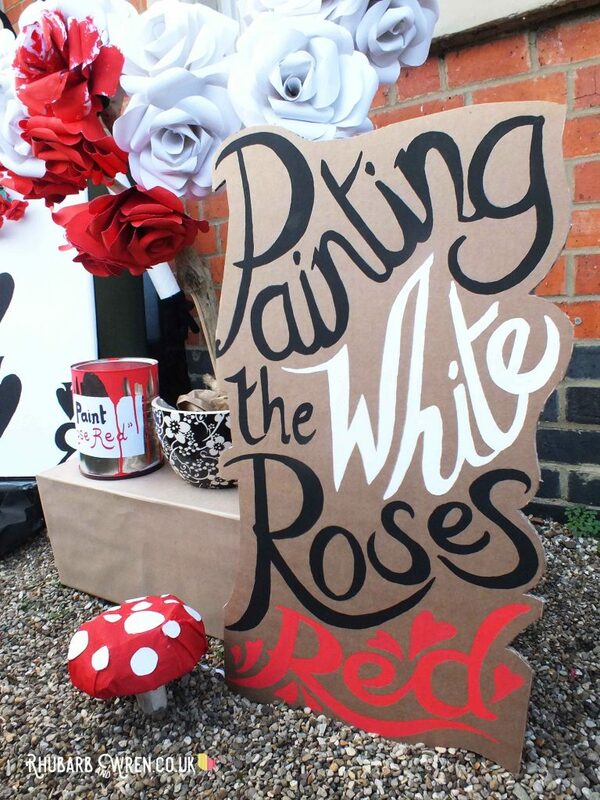 The “Painting the White Roses Red” sign is just good old poster paint on some more corrugated cardboard, and the mushroom is crepe paper, white label spots and a kitchen towel tube. It took a week of evenings and nap times to make all these bits. 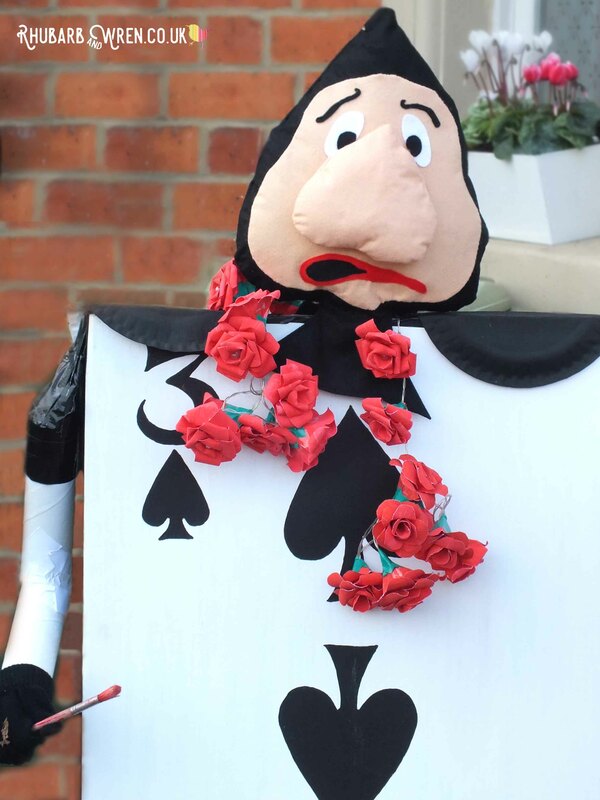 Our Playing Card Gardener scarecrow – heavily borrowing from the look of the classic Disney film! 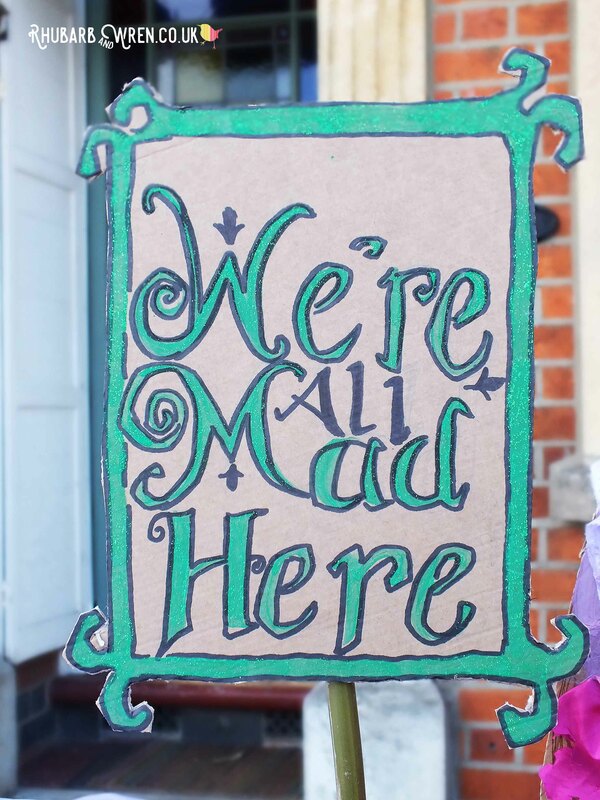 Quirky hand-painted sign, just in case anyone wasn’t sure what our scarecrow was up to! 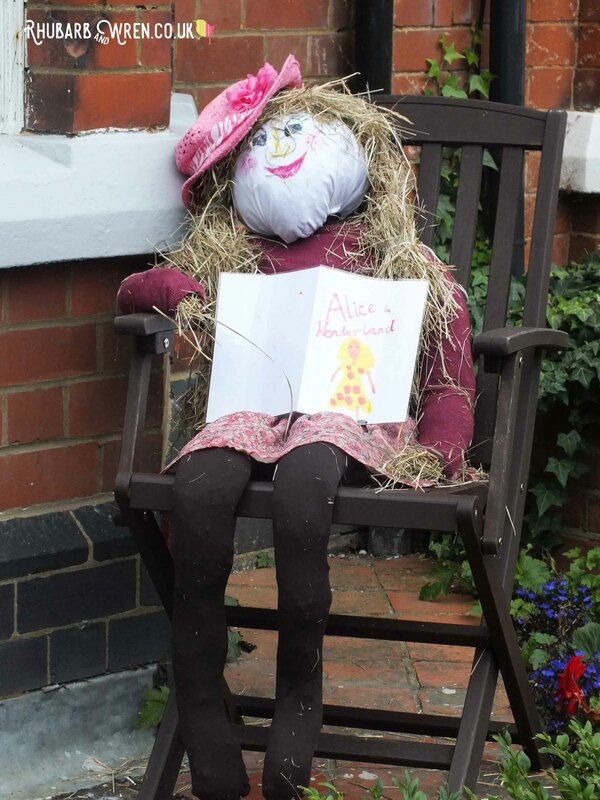 We had a great time making these Alice in Wonderland scarecrows, and an even better time showing them off and wandering around wonderland (and the greater community) to see everyones’ efforts. 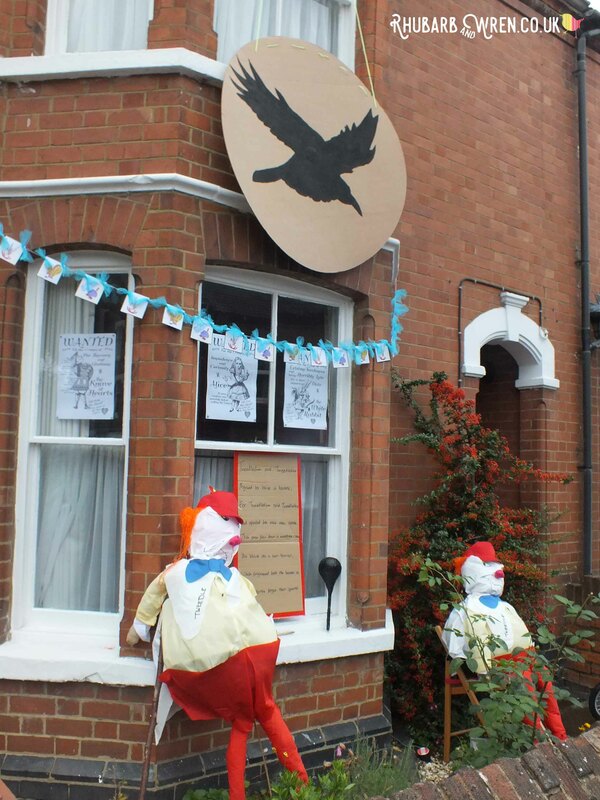 It was an amazing display of creativity and talent. I can’t wait for next year! 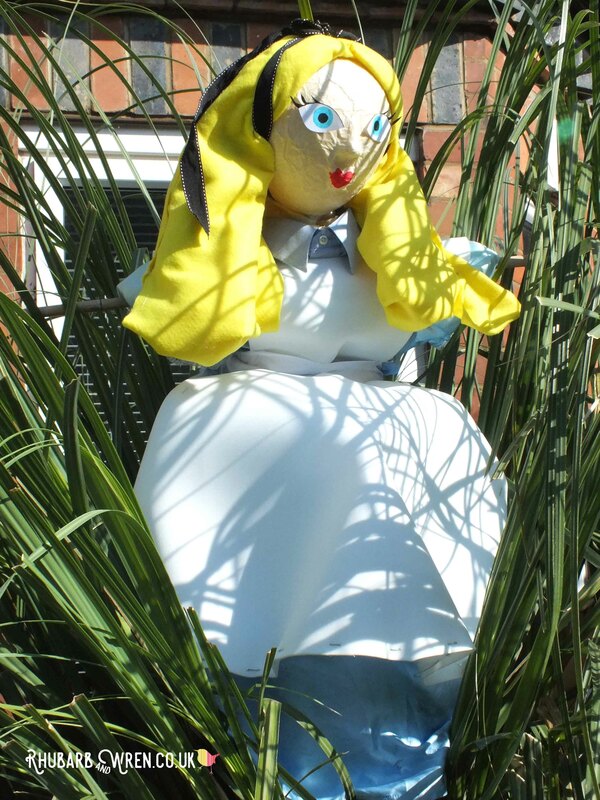 Check out the gallery below for all the Alice in Wonderland scarecrows from the festival! 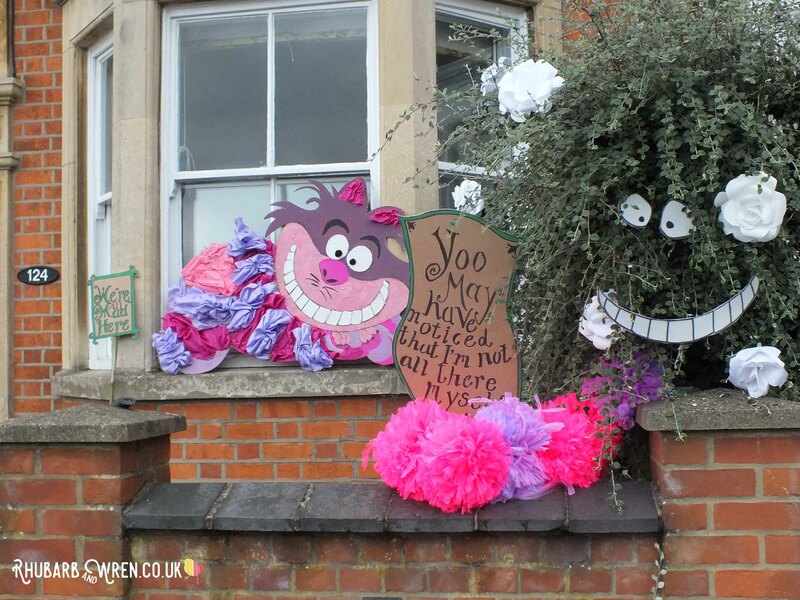 Alice in Wonderland, Books, Grown-up Stuff, Scarecrow Festival. Bookmark.